Hosting a giveaway or contest of any kind, takes hours of planning, prize costs, and shipping arrangements of prizes. So what are your responsibilities as a winner? It's simply to use proper etiquette and don't be a needy whiner! 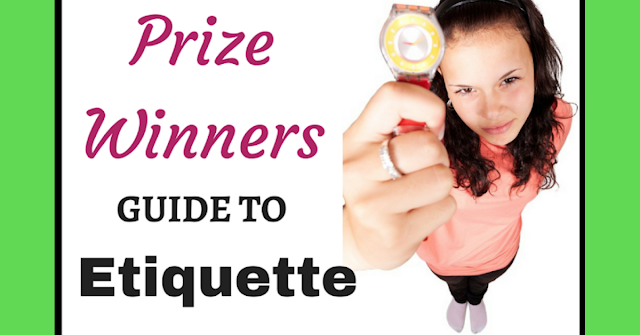 ETIQUETTE IF YOU HAVE WON A PRIZE. #2 Do NOT ask them publicly where your prize is on Twitter, Facebook or any social network BEFORE the 4-week mark. You make yourself look childish. #3 Do read over the rules and regulations to make sure you haven't disqualified yourself. #4 Make sure you respond to winning email or notification by the time indicated. If you wait 3 weeks to answer and email, your prize is no longer yours. Don't complain, just enter another contest. #5 Be thankful, thank the company or blogger that is giving you something for free. Winning a prize is a great feeling and prizes can be spectacular. Just remember the sun and the moon do not revolve around each of us no matter how much we may like to feel it does. If you have won a prize, don't for a second think that the person supplying it should be doing the hundred meter dash to the post office to mail your prize. Many bloggers ship prizes only once a month and that's that. Self-entitlement gets you nowhere. Be respectful, Be polite, And for goodness sake don't stalk a blogger/company while you await your prize. Step 3 Contact the Competition Bureau of Canada and file a complaint.